CryoDerm pain relieving prodcuts are used across the USA by chiropractors, massage therapists, physical therapists and sports teams to help relieve muscle and joint pain. It goes on cool and then almost creates a "mask" helping to block the pain. CryoDerm is great to apply on painful areas before bed to help you sleep. The roll-on makes it easy to apply. If you have a tension headache or migraine, apply Cryoderm on your neck to help alleviate the pain. CryoDerm is fast becoming the favorite topical analgesic amongst arthritis back pain sufferers because it works fast and provides soothing relief. Whether you suffer from muscle sprains & strains, bursitis, tendonitis, arthritis, back aches or other joint pain, you should try CryoDerm pain relieving spray or roll-on. Please understand that this is powerful, yet temporary relief and will not cure your ailment. But, neither does pain medication. 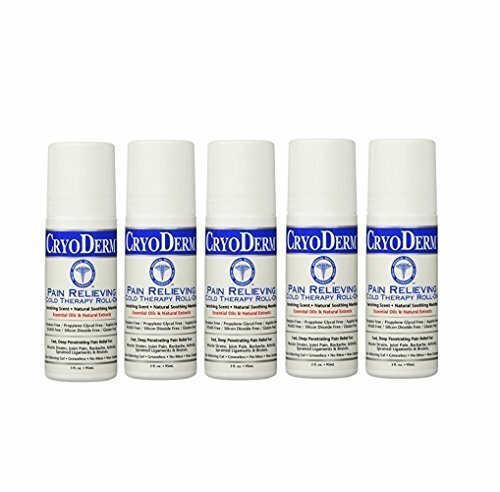 CryoDerm pain relief spray or roll-on is a natural way to achieve relief without taking harmful pain medication. There are several amazing ingredients in CryoDerm that help provide the pain relief. The main active ingredient is menthol, which is derived from peppermint oil. Other ingredients include: Arnica, Boswella, Ilex and MSM. Arnica, which is also known as leopard's bane has a bright yellow flower that blooms in the summer. For hundreds of years in Europe, homeopathic remedies were made using Arnica. Native Americans also used Arnica for various herbal remedies. The active compounds in Arnica, which are responsible for its ability to reduce pain, muscle strain/soreness and associated inflammation, are sesquiterpene lactones. Boswella refers to the resin of various species of Boswellia shrubs and small trees which are found in the Red Sea region and mountains of central India. It has been widely used as an Indian herbal medicine treatment for arthritis and bursitis.